Tinker Murtagh thinks his new job is simple, but he’s never robbed a medical clinic before—and he’s never dealt with someone like Dr. Henry Van Deman. 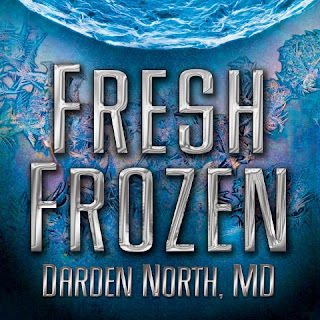 In “Fresh Frozen” by Darden North, human reproductive tissue becomes a fatal commodity as a childless young policeman and his deranged wife meet Lucille Wax and her sales catalogue of human embryo and egg donors. Suddenly their Mississippi community faces grisly murder, the world of Hollywood celebrity, and a physician with a black-market agenda. The lives of Carrie and Wesley Sarbeck, international superstar Allyn Saxton, and southern socialite Cheryl Choice unwittingly collide at the Van Deman Center, a state-of-the-art clinic for the treatment of infertility, housed in a once decaying building complex in Canton, Mississippi. The facility is equipped not only with modern medical technology but also a network of secret security cameras hidden in unconventional places controlled by cyber thief, Tinker Murtagh. While Dr. Knox Chamblee, Van Deman’s younger medical partner, treats his patients, he unknowingly promotes the deception, which preserves the dark secrets of the Van Deman Center of Reproductive Technology. The fast-paced suspense and rich dialogue in “Fresh Frozen” reveal how medical ethics can easily be discarded for the right price. Practicing ob/gyn physician Darden North is a national IPPY-awarded author in Southern Fiction. “Fresh Frozen” is North’s third novel and is narrated by Flora Plumb, a professional actress and voice artist. Plumb has narrated over twenty audio books.